Stale Gum: At one time, this was a $100 card. Fast forward ten years, and now it's just dollar-box fodder. Maybe the decimal point is just in the wrong place. 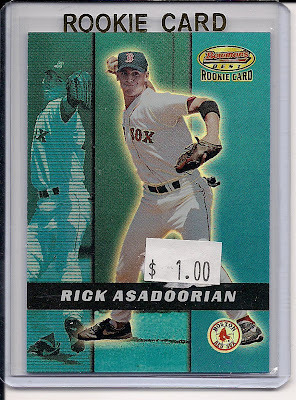 I clearly remember the day, roughly 10 years ago, that I pulled a 2000 Finest Asadorian out of a jumbo pack. It was then booking at $120! I should have sold it immediately. Still have it to this day. sruchris: I'll give you a buck for it! "Hmm. I've heard this guy's name mentioned during the Yankee game. The announcers put him over as a rising star with electric stuff, but he's only a relief pitcher. Plus, this guy won't come down from the "book value" of $8. I better pass." Too bad I didn't bite. That was a rookie of Johan Santana. Oops. 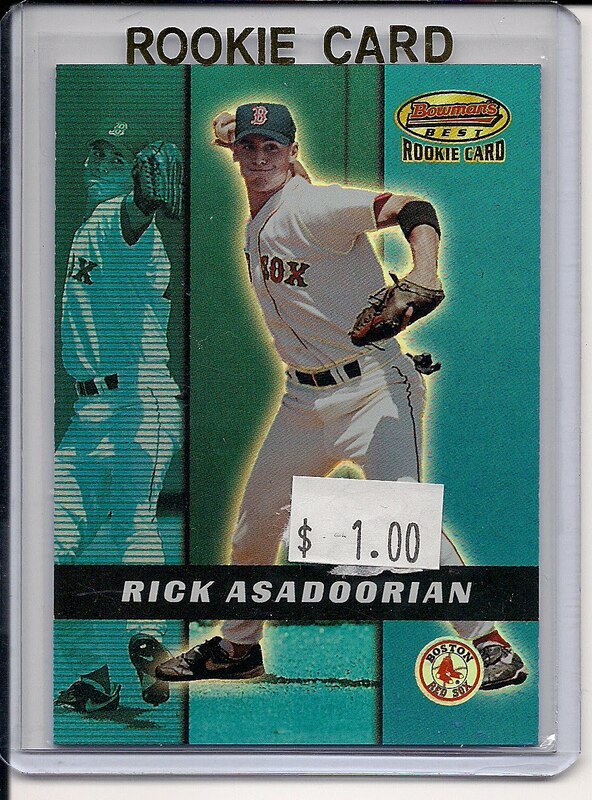 Oh Rick Asadorian how excited I used to be to see your cards. Along with Ryan Anderson you signify my failed attempts at prospecting. I need that card for my every Red Sox ever collection. What would you like for it?